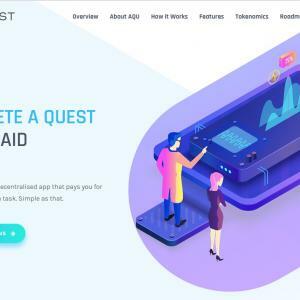 aQuest is a unique decentralized app that pays you for completing a certain task. Simple as that. aQuest offers its creators to create marketing campaigns that focus on rewarding its participants. Participants to a quest are required to finish a task in order to be eligible for a reward payment at the end of a quest. A task is a digitally verified action that a user is required to complete in order to successfully participate in a quest (Examples: Survey, Facebook Like). aQuest offers its creators to create marketing campaigns that focus on rewarding its participants. Participants to a quest are required to finish a task in order to be eligible for a reward payment at the end of a quest. A task is a digitaly verified action that a user is required to complete in order to successfully participate in a quest (Examples: Survey, Facebook Like).